In OOF2, before creating a finite element mesh, you must first create a Skeleton. The Skeleton defines only the geometry of the mesh. It does not include any information about Equations, Fields or finite element shape functions. All of that information is in the Mesh class, which will be discussed later. The Skeleton is an intermediate step between the pixelized Microstructure and the finite element solution. It represents the finite element discretization of the Microstructure. One Microstructure may contain many Skeletons, representing different discretizations. One Skeleton, in turn, may generate many Meshes, allowing different physics or different solution methods to be tried in a single geometry. The Skeleton Task Page contains tools for creating and modifying Skeletons. The Skeleton Info toolbox contains tools for examining the details of a Skeleton in the graphics window. The parts of a Skeleton. The green circles mark the nodes, the lines are the segments, and the spaces between the lines are the elements. When a Skeleton is constructed, it can be declared to be periodic in the x or y directions, or neither, or both. If it is periodic, then any modifications performed on one edge will also apply to the opposite edge, Every Node or Segment on a periodic edge will have a matching partner on the opposite edge. All skeleton modifications will maintain the periodicity of the skeleton. Periodic boundary conditions can only be applied to Meshes derived from periodic Skeletons. However, non-periodic boundary conditions can be applied to either periodic or non-periodic Skeletons. Skeletons are composed of triangular and quadrilateral elements, as shown in Figure 2.3. These are non-overlapping polygons that completely cover the Microstructure. Skeleton elements will be converted directly into Mesh Elements when a Mesh is created. Many Skeleton operations operate on the set of currently selected elements. Elements may be selected by the Skeleton Selection Task Page and the Skeleton Selection toolbox. 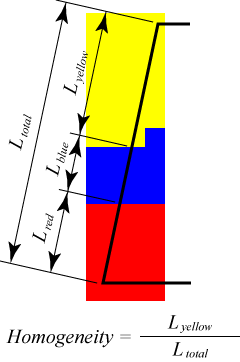 The homogeneity is computed by finding the area of the element that overlies each category of pixel. Pixels that have different assigned Materials or belong to different “meshable” PixelGroups are in different categories. The category claiming the largest area of the element is the dominant category. The homogeneity is defined as the ratio of the area of the dominant category to the area of the element as a whole. A completely homogeneous element has a homogeneity of 1.0. An element made up of N equal components has a homogeneity of 1/N. The Material assigned to an element is the Material of its dominant pixel category. The color of the pixels in an Image in a Microstructure does not directly affect the homogeneity of the elements in a Skeleton. Only material assignments and group membership contribute to homogeneity. However, Image pixel color affects materials and groups through the pixel selection mechanisms. If the three different pixel colors represent different Materials, then the triangle in the upper right is completely homogeneous (homogeneity=1.0), the central triangle is inhomogeneous (homogeneity ≈ 0.5) and the leftmost triangle is even more inhomogeneous (homogeneity ≈ 0.3). Many of the tools for modifying Skeletons, such as Anneal and Smooth, work by reducing an effective energy functional, , of the mesh. This functional assigns a number between 0 and 1 to each element. It is called an energy because of its role in the Annealing operation, where it plays the role of the energy in a statistical mechanical simulated annealing process. When then Skeleton modifications that use will not consider the shape of elements at all, and will result in homogeneous but badly shaped elements. When , modifications will not consider homogeneity, and will result in well shaped but possibly inhomogeneous elements. When , there will be a trade-off between shape and homogeneity. The homogeneity energy is simply one minus the homogeneity, so that it is minimized when an element is completely homogeneous. Finite elements are usually better behaved (the resulting matrix equations are easier to solve) if the elements do not have sharp angles or high aspect ratios. The shape energy function returns 0 for equilateral triangular or square quadrilateral elements, and 1 for elements that are degenerate (ie, have an aspect ratio of 0 or three collinear vertices). where is the area of the element and is the sum of the squares of the lengths of its sides. The nodes at the corners of an element are ordered. The perimeter of the element is traversed counterclockwise when moving from one node to the next. Any operation that breaks this ordering makes the element illegal. Elements with three collinear nodes are also illegal, as are non-convex quadrilaterals. (Such elements introduce singularities and instabilities in the finite element stiffness matrix.) Figure 2.5 illustrates how node motion may create illegal elements. Most Skeleton tools will refuse to create illegal elements. The one exception is the Move Node toolbox, which allows the user to move nodes by hand. Sometimes it may be necessary to temporarily make an illegal element while moving a bunch of nodes. Moving the node in the left hand figure results in two illegal elements in the right hand figure. The shaded triangle is illegal because its nodes (numbered 1,2,3) are out of order. The highlighted quadrilateral is illegal because it is not convex. The nodes of a Skeleton element are the corners of the element, as shown in Figure 2.3. Unlike real finite elements, Skeleton elements may not have nodes along their edges or in their interiors. Many Skeleton operations operate on the set of currently selected nodes. Nodes may be selected by the Skeleton Selection Task Page and the Skeleton Selection toolbox. Node Mobility. Nodes may be moved when a Skeleton is modified. Different nodes have different degrees of mobility. The Nodes at the four corners of a Microstructure can never move. The Nodes along the edges of a Microstructure can move along the edge, but cannot move into the interior. All the interior Nodes can move freely (see Figure 2.6). In addition, any Node may be explicitly pinned to prevent it from moving at all. Many Skeleton operations operate on the set of currently selected segments. 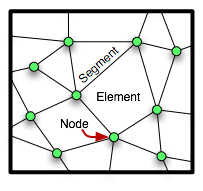 Segments may be selected by the Skeleton Selection Task Page and the Skeleton Selection toolbox. Segment Homogeneity. Homogeneity can be computed on Segments just as it can on Elements. Analogous to the definition of Element homogeneity, the homogeneity of a Segment is defined as the fraction of the length of the segment that lies above that Segment's dominant pixel type. See Figure 2.7 for a graphical representation. Yellow is the dominant pixel color along the segment. Thus, the homogeneity of the Segment is the ratio of the fractional length covered by yellow pixels along the Segment Lyellow/Ltotal. The components of a Skeleton, elements, nodes, and segments, may be placed into named groups. These groups form a convenient way to save and recover sets of selected objects. Groups are created and manipulated by the Skeleton Selection Task Page. Skeleton boundaries define the places where boundary conditions will be applied when solving equations on a Mesh. The Mesh inherits its boundaries from its Skeleton. There is no way to create boundaries in a Mesh directly. Boundaries may coincide with the perimeter of the Skeleton, but there is no requirement that they do so. Boundaries are created and manipulated by the Skeleton Boundaries task page. Edge boundaries are composed of directed sets of conjoined segments. Each Skeleton automatically contains edge boundaries named top, bottom, left, and right. Dirichlet, Neumann, and Floating boundary conditions may be applied at edge boundaries. Point boundaries consist of sets of nodes. Each Skeleton automatically contains point boundaries named topleft, topright, bottomleft, and bottomright. Dirichlet, Floating, and Generalized Force boundary conditions may be applied at point boundaries.